These Air Fryer Shrimp are covered in a crispy coconut breading and paired with a delicious Sweet Thai Chili dipping sauce. It’s the perfect appetizer recipe for your Air Fryer. I’ve got a love for fried seafood and thanks to my Air Fryer, I can have “fried” seafood anytime I want without all the added grease and deep frying. For example, this Crispy Air Fryer Fish recipe is a favorite among readers and in our house. 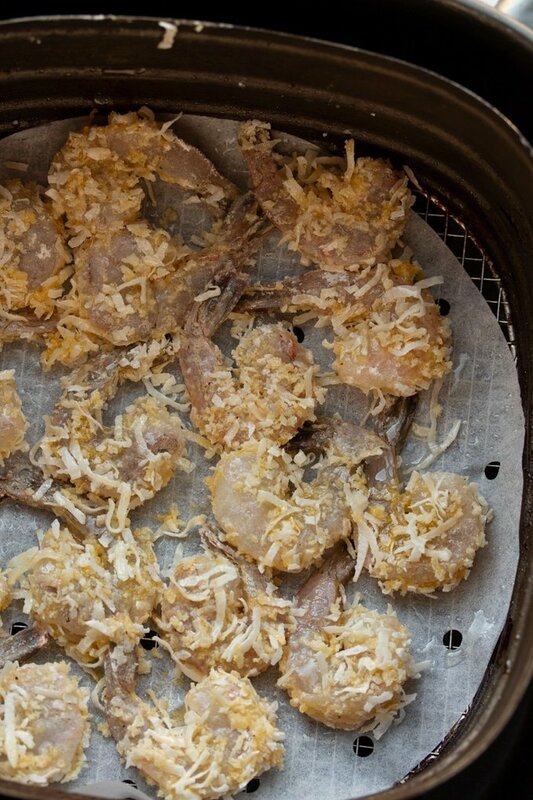 This coconut air fried shrimp has now been added to our favorites. It may seem weird cooking shrimp in an air fryer since shrimp is so delicate and can overcook, but I found that my shrimp cooked perfectly in my Air Fryer. 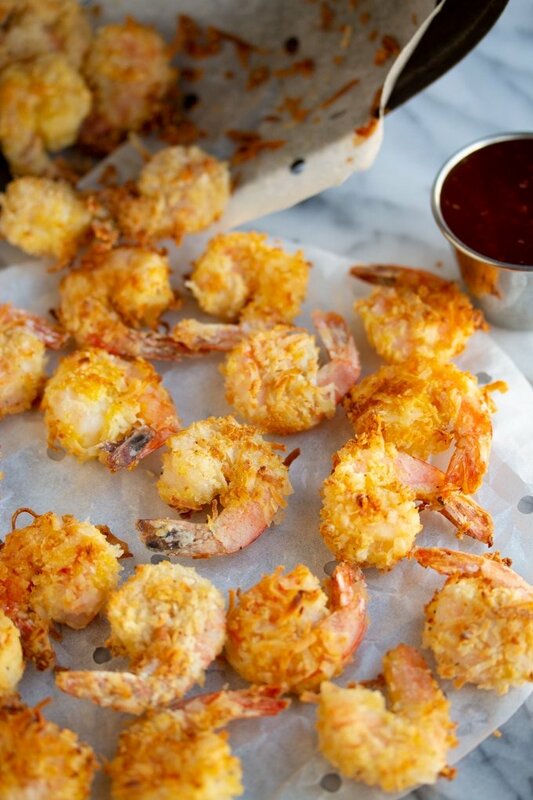 I like the crispy coconut coating on these shrimp and it is a restaurant quality appetizer. I’m sure you will have a few questions about cooking shrimp in your Air Fryer so I’ll detail my experience below. 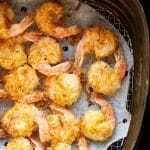 Can you cook raw shrimp in an Air Fryer? Yes. That’s what this recipe calls for. I tend to only use cooked shrimp for salad recipes, like this Cold Seafood Salad recipe. But for any recipe that calls for shrimp to be cooked, I recommend raw shrimp. For this recipe, I use large defrosted peeled and deveined raw shrimp. 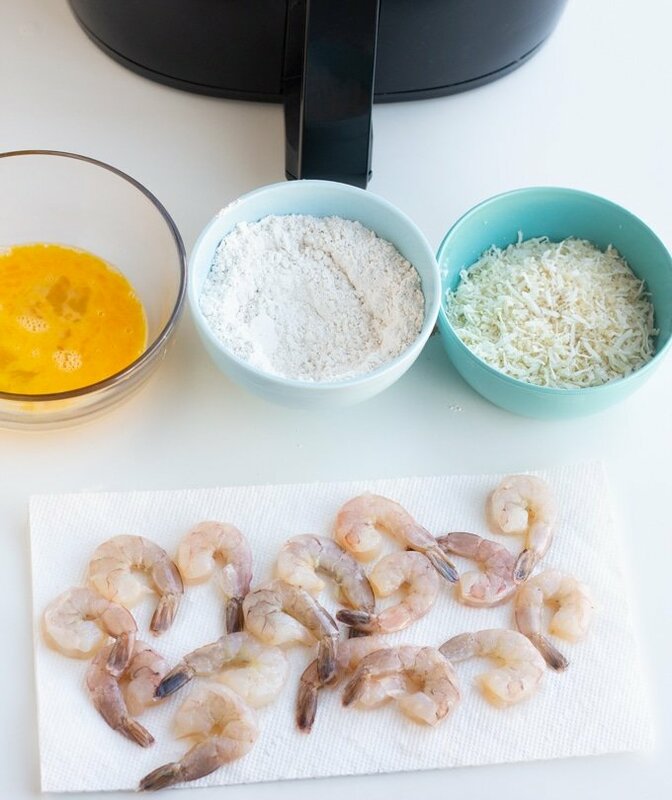 How to make Crispy Air Fryer Shrimp? 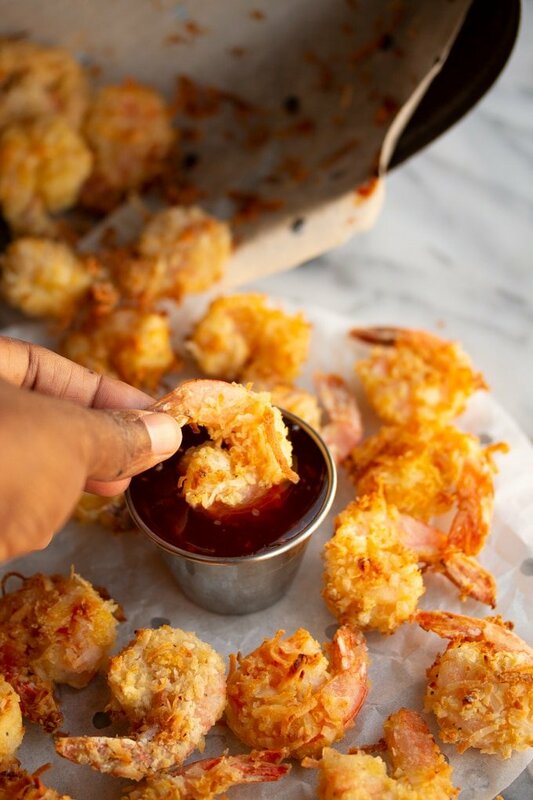 The key to getting this shrimp extra crispy is using flour, egg, panko breadcrumbs and shredded coconut to bread the shrimp. This will give you that extra delicious crisp exterior with a well cooked interior. First, preheat your Air Fryer oven to 390 degrees Fahrenheit. Make your dredging station with flour, beaten egg, and panko breadcrumbs and coconut mixed in a bowl. Grab your large raw peeled shrimp and make sure they are clean and dry. I like to keep the tail on the shrimp for easy dipping. Next, you will dip each piece of shrimp in your bowls in the following order: First the flour, next the egg, and then the panko and shredded coconut mixture. Then, place you shrimp in a greased air fryer basket in a single layer. You can also use these handy parchment paper liners with holes if you don’t feel like greasing the basket or if you want easier clean up. If greasing your Air Fryer basket, I recommend spraying with a spray bottle filled with oil. I find the parchment liners very helpful when it comes to recipes like this one. I talk a little more about these accessories in my 10 Air Fryer Accessories that are worth your money post. Once your shrimp is placed in the basket, spray the shrimp lightly with oil. Then close your Air fryer basket and cook for 4 minutes. After 4 minutes is up, flip your shrimp, then spray the other side. Close the Air Fryer basket and cook for 5 more minutes. Once your shrimp is cooked on both sides, remove from the basket and serve with thai sweet chili sauce…it’s the perfect flavor combination. You can find a bottle of the sauce in the International section of most supermarkets or find it here. If you’re feeling up to it, you can also make your own Sweet Thai Chili Sauce. I hope you enjoy this Air Fried Coconut Shrimp as much as we do. This easy and delicious Crispy Air Fryer Coconut Shrimp with Dipping Sauce is the perfect way to prepare shrimp in your Air Fryer. The shrimp is perfectly cooked and dipped in Sweet Thai Chili Sauce. Clean and dry shrimp. Set aside. Grab 3 bowls. 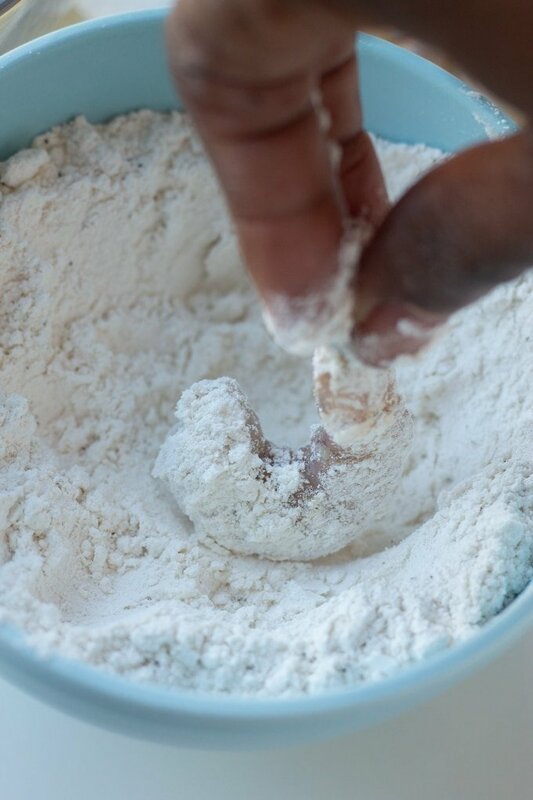 Place flour in one bowl. Place beaten egg in the second bowl. 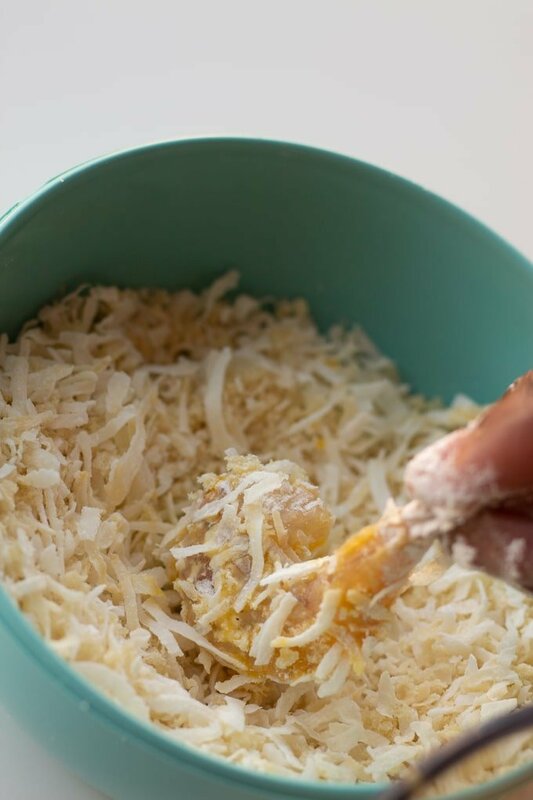 Combine coconut, breadcrumbs, salt, and black pepper in the third bowl. Preheat your Air Fryer to 390 degrees Fahrenheit. This should take about 3 minutes. 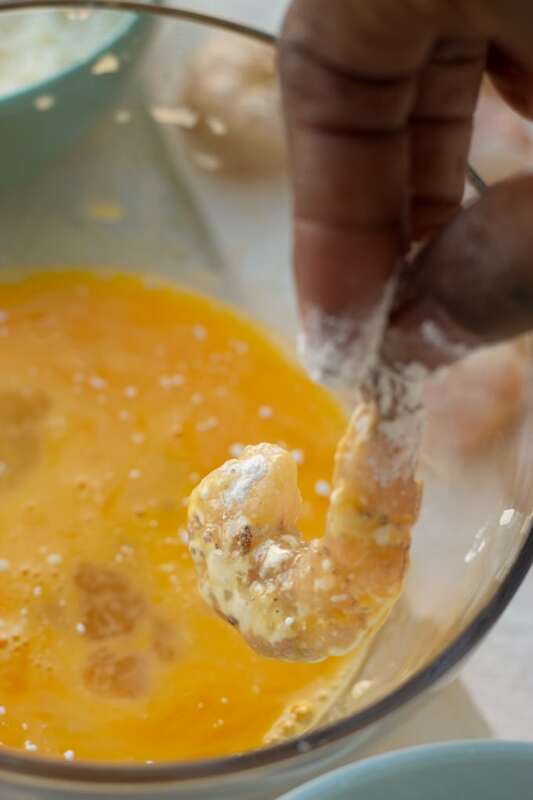 Dip each shrimp in flour, then egg, then coconut mixture, ensuring shrimp is covered on all sides during each dip. Place shrimp in single layer in Air fryer basket that has been greased. Lightly spray the shrimp with oil and then close the Air Fryer basket. Cook for 4 minutes. After 4 minutes, open air fryer basket and flip shrimp over. Spray shrimp again, close air fryer basket, and cook for 5 more minutes. Vegetable oil, olive oil, or avocado oil can be used for spraying. If using parchment liners, do not place liners in air fryer during preheating. Place shrimp evenly on liners before starting Air fryer. This avoids the liner from flying up into the heating element. 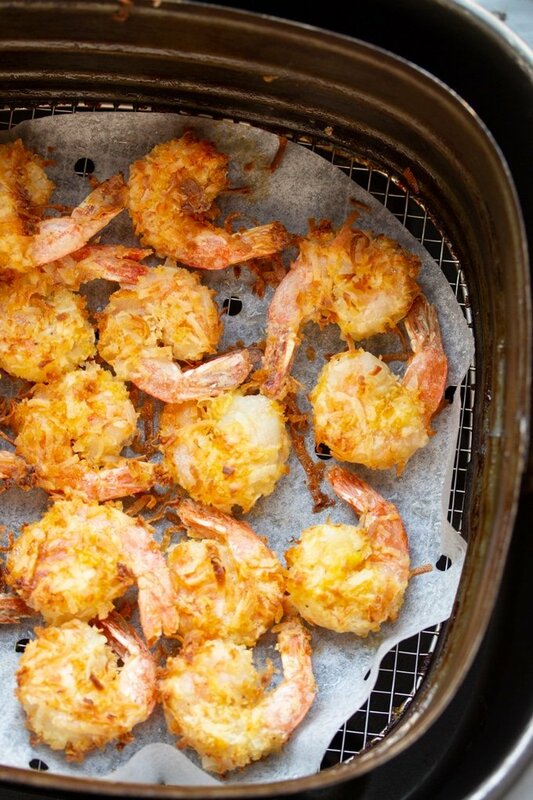 Make sure shrimp are in a single layer in the air fryer basket. You may have to cook shrimp in batches to ensure even cooking and crispiness. We love coconut shrimp and this is the first thing I made with our new air fryer. This recipe is so easy and absolutely delicious! Now we enjoy it at least once a week! This shrimp looks perfectly crispy, I want it! 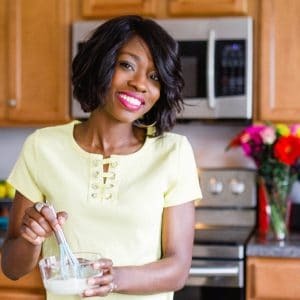 I’ve been on the fence about getting an air fryer, but this recipe has me convinced to go for it! These shrimp are so amazing! I am definitely making again for Super Bowl Sunday! 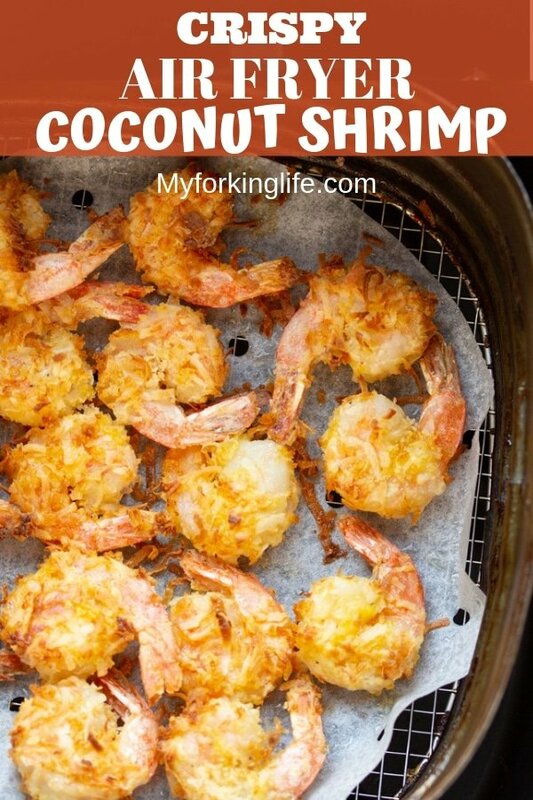 I fell in love with coconut shrimp while visiting the Caribbean, so I’d love to be able to make this at home! Using an air fryer is a great way to keep the calories lower too!